WELCOME TO AM FLOWER FARM. My name is Andrea Morris. 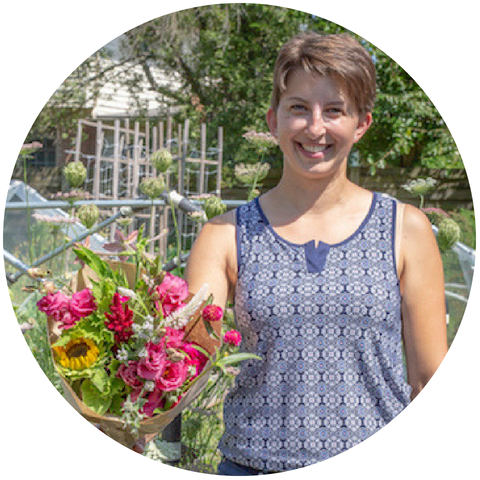 I am the woman behind AM Flower Farm, a West Lafayette, Indiana, urban, sustainable flower farm. We grow fresh, seasonal flowers from April through October for Greater Lafayette homes, businesses, and special occasions. Follow the farm on Facebook or via my weekly email newsletter. I am the grower, the seller, the marketer, and the designer behind AM Flower Farm's flowers. Austin's primary role is to chase pesky rabbits out of the beds, a task for which he shows immense talent. 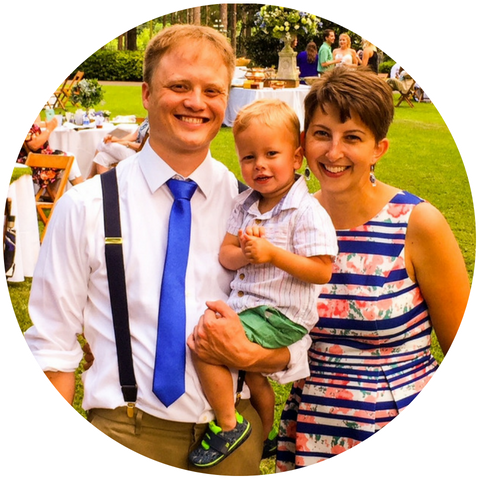 Aaron is NOT a flower farmer, but he provides encouragement, engineering ideas, and business feedback. Getting to do work I love every single day is an incredible gift, one I am learning to value more and more as I develop this farm business. I love that I get to have my hands in so many fields of work: organic farming, web design, business, marketing, floral design, events...the list is practically endless. I also love that I get to meet new people every week at my markets, many of whom have fascinating stories about their own farms, their own wedding flowers, their own business dreams, and more. Keep the stories coming. We focus on selecting pretty colors, unique varieties, and perfectly imperfect designs that bring nature inside your home. Our flowers are hand-harvested, just days before sale, to ensure fresh, long-lasting bouquets that will delight you. We use organic practices for growing and take great care to welcome beneficial insects like bees, ladybugs, and butterflies, and the urban farm is a haven for other wildlife such as hummingbirds and finches. We are located in Bar Barry Heights neighborhood, just a few blocks from the intersection of Salisbury Street and Sagamore Parkway.